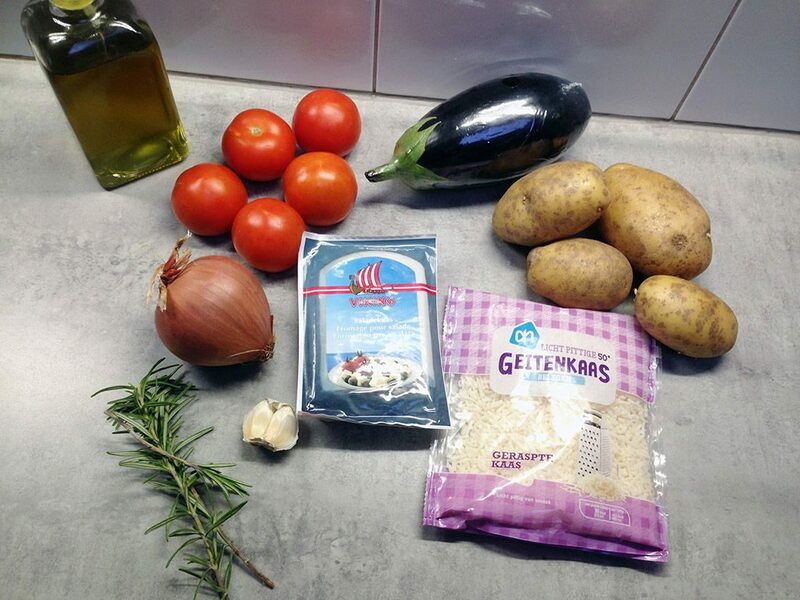 You have probably seen it before on Ohmydish, the Dutch foodblogswap. 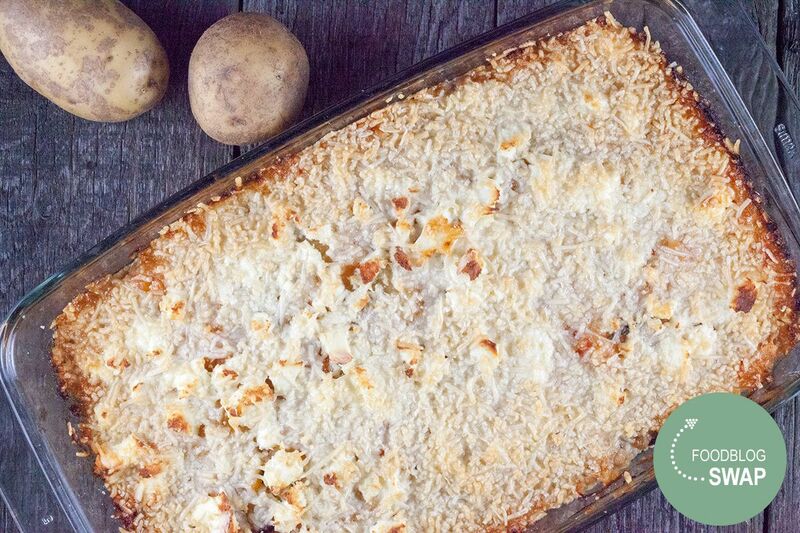 This month we made a casserole using this recipe as an inspiration. REMOVE the hard parts from the tomatoes and chop them into pieces. PEEL and finely chop the onion and garlic cloves. HEAT olive oil in the skillet and sauté the onion and garlic for a few minutes. ADD the tomato pieces along with the rosemary sprigs and 200 ml water. PLACE the lid on the skillet and let it cook for about 10 minutes. Meanwhile RINSE the eggplant and slice into thin slices. PLACE the slices in the colander, sprinkle with salt and wait about 10 minutes. Meanwhile PEEL the potatoes and also slice them into thin slices. PAT the eggplant slices with paper kitchen towels to get rid of the excess water. HEAT the grill on high heat and drizzle the eggplant with olive oil. GRILL the slices shortly on both sides, until the grill pattern appears. PRE-HEAT the oven to 175 degrees Celsius or 350 degrees Fahrenheit. As soon as the tomatoes and onion are softened enough, REMOVE the rosemary and use an immersion blender to create a smooth sauce. SEASON with pepper and salt and cover the bottom of the oven dish with a very thin layer of sauce. DIVIDE a layer of grilled eggplant on top followed by a layer of thin potato slices. 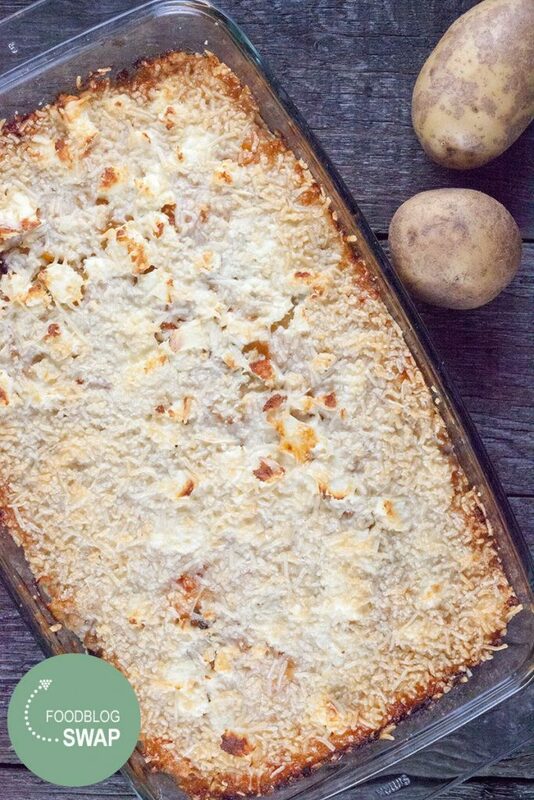 COVER the potatoes with a layer of tomato sauce and CRUMBLE half of the feta on top. REPEAT until all the ingredients are used and make sure the sauce is on top of the potatoes to help them cook easier. FINISH with a layer of grated goat’s cheese. COOK the casserole in the oven for about 50 minutes, depending on your oven. 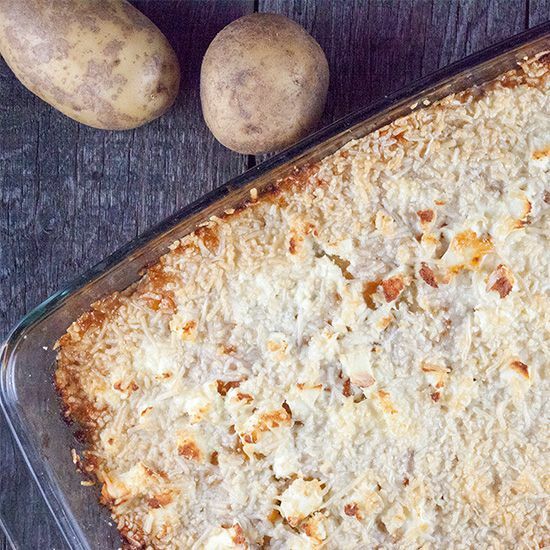 If the cheese is already too dark, but the potatoes aren’t done yet you can cover the oven dish with tin foil. Enjoy!